It’s fascinating to see what you can find when you dig through your old notes and drafts. Interesting insights that slipped your mind, funny stories you’d want to tell again, and wonderful accomplishments that remind you of better times and better techniques than what you may have slipped into using. But, perhaps most fun to find? Unfinished drafts and projects that you couldn’t finish for one reason or another at the time, but have since come into the right knowledge and tools to do just that. This post is one such example of that happening, and I’m glad to finally share it with you, dear reader, after so long. 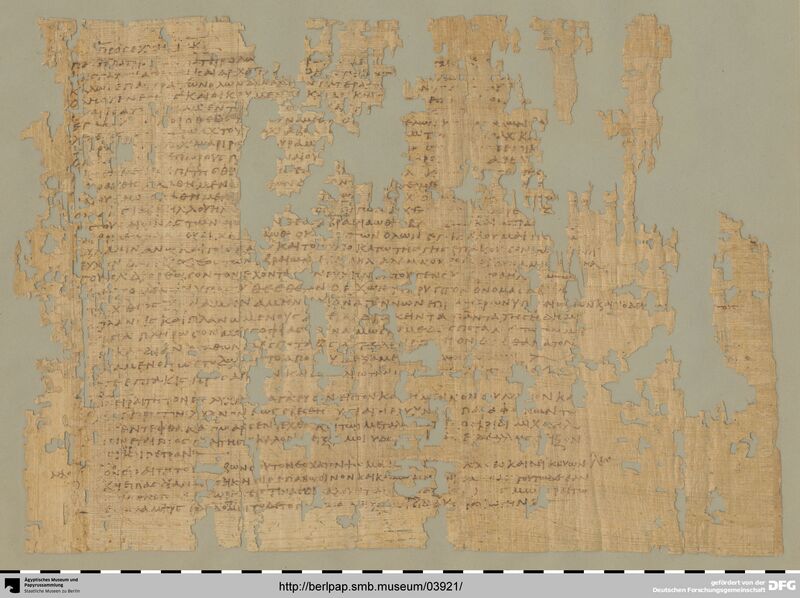 As many of my readers know, the Greek Magical Papyri (PGM) is such a wonderful collection of texts that have, somehow, miraculously survived to our care in the modern day. It’s on the same level as the Nag Hammadi Scriptures or the Dead Sea Scrolls, but which focuses instead on the so-called “practical Hermetica”, the spells, rituals, ingredients, and ritual processes of theurgy and thaumaturgy as used by actual living mages and priests from roughly 100 CE to 500 CE, largely residing in that philosophical-academic-spiritual orgiastic environment of Alexandria, Thebes, and other parts of Hellenic Egypt. It’s important to remember, though, that the PGM isn’t just a single “grimoire”, but rather a collection of smaller grimoires, notes, tablets, and other texts from a variety of magicians that happened to be clustered together under a single volume. There’s quite a lot of variation in there, and if different entries seem counterintuitive or contradictory to each other, that’s because they are. It’s not proper to treat the PGM as “a single text”, but rather a collection of numerous texts that happened to be collected over the centuries and only recently compiled into a single volume (specifically, the Betz version of the PGM, though Preisendanz’s texts, volumes one and two, is still considered the earlier and other major version). Although many of the fun rituals that are more commonly known come from the earlier PGM entries, such as the Headless Rite from PGM V or the Heptagram Rite from PGM XIII, the Betz version of the PGM has over 130 sets of PGM texts, including a number of Demotic ones, too. Not all of them are well-preserved, and some are incredibly fragmented with extensive lacunae, but there are still plenty of gems in some of the lesser-known texts. One such text is PGM XXIIb.1—26, headlined as the Prayer of Jacob. The term used for “prayer” in the headline, προσευχή, can also be used to refer to a temple or sanctuary, especially of the Jews, so perhaps a better headline for this might be, if we can be granted a bit of translator’s license here, the “Holiness of Jacob”. Given its structure and its placement, the attribution is (as it almost always is) spurious, but the fact remains that it’s primarily a Jewish, or at least heavily Judaically-inspired, prayer with some Gnostic elements as well as some elements of Merkabah and Heikhalot literature or proto-literature. In any case, it’s mostly complete, but isn’t wholly so due to the large number of lacunae. Most of the lacunae appear in the strings of barbarous words, though when looking at the actual text, the size and location of these lacunae become clearer, offering hints of what may have gone into them. After all, the whole section is only 26 lines of text long, and the rest of the PGM is replete with invocations, strings of godnames, and a variety of other clues that can help fill in some of the lacunae in the text. One of my earlier projects from a number of years ago (2013, according to the original draft post) was going to attempt a reconstruction and repair on this entry, but I didn’t really know where to go or how to attempt it, and so I just left it to get buried in the drafts folder. But now that I’m a little older and a little more comfortable with this project, I want to try tackling it again. [Creator of all], … , creator of the angels and archangels, creator of the [saving] names! The [god who sits upon the] Sun, ΙΑΩ, he who sits [upon] … ΤΑ … Ω … Ι … Χ! [He who sits upon] the … ΜΑ … ΣΙ, ΑΒΡΙΗΛ ΛΟΥΛΗΛ … Μ! to the ages of ages, God ΑΒΑΩΘ ΑΒΡΑΘΙΑΩΘ [ΣΑΒΑΩΘ] ΑΔΩΝΑΙ star … and ΒΡΙΛΕΩΝΑΙ ΑΔΩΝΑΙ ΧΑ … ΑΩΘ the Lord of the All. I call upon you who give power [over] the Abyss [to those] above, to those below, and to those under the earth; hear the one who has [this] prayer, O Lord God of the Hebrews, ΕΠΑΓΗΛ ΑΛΑΜΝ, of whom is [the] eternal power, ΗΛΟΗΛ ΣΟΥΗΛ. Maintain the one who possesses this prayer, who is from the stock of Israel and from those who have been favored by you, O god of gods, you who have the secret name ΣΑΒΑΩΘ … Ι … Χ, O god of gods, amen, amen! You who produce the snow, who presides over the stars, who live beyond the ages, who constantly traverse the cosmos, and who cause the fixed and movable stars to pursue all things by your creative activity, fill me with wisdom. Strengthen me, Master! Fill my heart with good, Master, as a terrestrial angel, as one who has become immortal, as one who has received this gift from you, amen, amen! This entry, further, is ended with a single direction: recite it seven times facing north and east. I interpret this as meaning northeast, which would have been the direction of Jerusalem (or other places in Israel) from most places in Egypt, but there are other rituals in the PGM and other texts of that time like the Sepher haRazim that discuss how to conjure or pray to the powers of the Sun towards the East in the daytime or towards the North at nighttime, so it could be a synthesis of that, too. I lean towards the Jerusalem theory, personally. γενὰμενον, ὡς τὸ δῶρον τὸ ἀπὸ σοῦ δεξάμενον, ἀμήν, ἀμήν. Λέγε ἐπτάκις πρὸς ἄπρκτον καὶ ἀπηλιὼτην τὴν προσευχήν τοῦ Ἰακώβ. Happily, at least this part of PGM XXIIb (P. 13895 in the Staatliche Museen in Berlin) has been digitized, but between the lacunae and the faintness of the ink in places, it’s still awfully hard to read, even if we can get a sense for how long some of the barbarous words should be. My original goal, a few years ago, was to try to see what barbarous words would fill in these gaps through a combination of comparative analysis between this and other PGM entries, as well as through straight-up divination and trancework. But I realized, after looking at these lacunae, that it’s not possible to figure out what might just be a barbarous word and what actually might be legitimate Greek, and Lord knows my Greek is awful at best. Some of the natural impulses I have, like replacing ΧΑ___ΑΩΘ with ΧΑΧΒΑΡΑΩΘ by adding in a few letters (in bold) to make it sound fairly appropriate based on what we see elsewhere in the PGM, make sense, but then there are others that just wouldn’t go along with that, or where there’s just not enough available to sensibly reconstruct, especially when we don’t know whether, for instance, ΚΑ__________ (in the first line) is a barbarous word (it probably is!) or one of the almost 5000 Greek words (according to Perseus-Tufts) that start with kappa-alpha. My original approach just wasn’t going to work in any way I was going to be comfortable with or competent at, which is why I put this project off for so long. The final line of the prayer contains instructions to recite the prayer seven times. The number seven was of course of symbolic importance. The final line is governed by aorist middle participles which agree with the aorist imperatives. This would indicate that at the moment God fills the petitioner with wisdom, empowerment, and good, he or she becomes an angel and receives these as God’s gift. Some ambiguity remains as to when the transformation was thought to occur, whether it is during the process of repetition that the reciter is transformed into an immortal angel or if the one offering the prayer must wait until the seventh round of repetition and thus the ritual is entirely complete. The directions of north and east suggested by the rubric are understood by Reimund Leicht to be a “clear hint that it was conceived of as an invocation of Helios-Yao-Yaoil at night,” but this is a problematic claim because our prayer is addressed not to Helios-Yao, but to the God of Israel who is enthroned above Helios-Yao. In this point, our Prayer of Jacob is very similar to the PGM Prayer of Jacob (PGM XIIb). Although both texts largely differ, they have crucial elements in common: Both are prayers directed to Yaô, the creator of the world, and both adapt motifs of the celestial throne with the cherubim (PGM XXIIb 8). The two sentences “(You who) give power ov[er (the) cha]sm (to those) above and those below and those under the earth” and “[He] who is upon (the) stars abo[v]e (the) ages” remind us of the adaptation of Is 6:3 in 2:20 (fol. 2a/13 f.). Finally, the request for “wisdom” (XXIIb 17) is not very far removed from our Prayer of Jacob. The instruction to “say the prayer of Jacob seven times to (the) North and East” (PGM XIIb 20) is a clear hint that it was conceived of as an invocation of Helios- Yao-Yaôil at night. * These similarities are certainly not sufficient proof of a direct dependency, but they can be taken as hints that the two prayers may be rather remote relatives. * The North is the place where the sun is at night and in the East it rises. For an invocation of Helios at night from the North cf. Sefer ha-Razim IV/43; for an invocation of the sun from the East cf. PGM XIII 254. PGM V.459—489: “Another way” to “loosen shackles, makes invisible, sends dreams, [and is] a spell for gaining favor”. Again, with heavy Jewish influences, including the barbarous words ΒΑΡΟΥΧ ΑΔΩΝΑΙ ΕΛΩΑΙ ΑΒΡΑΑΜ, which can be easily read as Hebrew for “Blessed be my Lord, the God of Abraham” (“barukh ‘Adonai, ‘Eloah ‘Abraham”). PGM IV.1227—1264: “Excellent rite for driving out daimons”, another Judaically-influenced but also Christianically-influenced prayer of exorcism, with references to Abraham, Isaac, and Jacob, along with the Christian Trinity. PGM XII.270—350: “A Ring, a little ring for success and favor and victory”. A ring consecration ritual with a lengthy prayer including a long string of barbarous words with references to Abraham, Isaac, and Jacob, though this shows far more Egyptian influence than anything else. PGM III.1—164: “The ritual of the cat”, a lengthy and highly syncretic quasi-grimoire with some Jewish and Abrahamic elements. Based on these texts, what I did was basically synthesize parts of them together, using the incomplete Prayer of Jacob as given in PGM XXIIb as a base, and overlaying it with parts from other prayers that fit well, especially those with similar purposes as the Prayer of Jacob. After a few rewrites, reorganizations, and slight additions to the text for flow and content, what we end up with is a new prayer. As a result, however, due to how badly preserved the barbarous words are from the original text, sometimes I went with replacing them entirely from another source rather than trying to see what might fit in the right places. Now, I’m not exactly a fan of swapping out one set of barbarous words for another—Tobias over at Sublunar Space and I have discussed doing that and how it can lead to some disastrous consequences—but some of these entries are so similar to the Prayer of Jacob in approach and style that I think we can do so safely here, so long as we’re smart about it. However, there’s a weirdness here; in all the texts that have a similar list of barbarous words, or a similar arrangement of qualities such as “you who sit upon X”, including PGM XXXV.1—42 and the Beirut phylactery for Alexandra daughter of Zoē (cf. D. R. Jordan, “A New Reading of a Phylactery from Beirut”, ZPE 88, 1991, pp.61-69), it would seem like these refer to different spirits or angels of particular things rather than attributes of God, yet the Prayer of Jacob from PGM XXIIb treats them as just that: attributes and names of God. There’s definitely a tradition of prayers going on here, but it would seem that the Prayer of Jacob is an outlier in how it treats these lists of names and dominions. That said, when we read “you who have the secret name ΣΑΒΑΩΘ”, with ΣΑΒΑΩΘ being a rendition of Hebrew Ṣabaot or “Hosts” referring to the innumerable angels…well, it kinda makes sense, either which way, at least to the mind of the practical Hermeticists of the PGM. The fact that the same structure and form of prayer is present in a number of unrelated sources is significant, but equally so is the vast disparity between the divine names used. It’s my hunch that the names are less important than the structure, and as such, the sets of names can largely be interchangeable with each other. It’s not an ideal situation, but it does allow us some wiggle room for experimentation, and given that the barbarous words are so incomplete and damaged in PGM XXIIb, we can’t really use them anyway—but I claim that we can use those from near-identical prayers elsewhere with as good a result. In the name of ΣΕΜΕΣΕΙΛΑΜ who is above all the heavens! by the garment of ΕΛΟΗ, by the might of ΑΔΩΝΑΙ, by the crown of ΕΙΛΩΕΙΝ! Protect me from every daimōn and every power of daimones and from daimonia and from all pharmaka and katadesmoi! O Father of the Patriarchs, of the All, of the powers of the cosmos! O Father of the angels and archangels, of the redeeming names, of all the powers! O Father of the whole cosmos and all creation, both uninhabited and inhabited! O Father to whom the cherubim and seraphim are subjected! O Father who showed favor to Abraham by giving the kingdom to him! O God of the angels and archangels, o King of kings, o Lord of lords! you whose name is blessed and holy unto the ages of ages! the Lord of the All! to those above the Earth, to those upon the Earth, and to those below the Earth! Hear your servant who prays to you in your name with your names! to whom is eternal might, God who is God of all gods! maintain him who is of those who have received your favor, o God of gods! you who have the secret name ΣΑΒΑΩΘ! o you who make the stars and planets marshal all things by your creating power! that I might receive this gift from you! by the crown of God! Protect me from every spirit, every power, every phenomenon, every spell, and every curse! O Origin of the heavens! The Lord of Balaam, the God who made Heaven and Earth and all within it, the Lord of the All! to whom is eternal might, o God who is the God of all gods! o God of Abraham, o God of Isaac, o God of Jacob, o God of gods! Most of the changes, especially in the barbarous names, come from other PGM sources; while the Prayer of Jacob from PGM XXIIb is the most important part of the Prayer of the Patriarchs, the initial invocation of the angels of the seven heavens came from PGM XXXV and the Beirut phylactery (the PGM section in question lacks an angel for the seventh heaven), and the godnames preceding the “You who sit over…” invocations came from PGM XII. Besides those, the only other major structural change is the addition of the full lineage of pre-Flood Patriarchs, from Adam to Noah, then ending with Abraham, Isaac, and Jacob. I personally like doing this, because it implies a descent of divinity and spiritual heritage from the first man down to the forebears and founders of the Israelites and Jewish people. Although none of this is in the Prayer of Jacob proper (I mean, if it was said by Jacob, then we wouldn’t expect to find his own name used in his own prayer praisingly), we do see Abraham, Isaac, and Jacob put together in other sections of the PGM. By throwing in the pre-Flood Patriarchs, I though I would be able to tap more into the raw divinity that they had from a time immemorial. Additionally, from PGM XXXV.1—42, I also added in the prophet Balaam, a contemporary of Moses and the only non-Israelite prophet in the Old Testament. The inclusion of Balaam is significant, because God made Balaam, a non-Israelite and thus not one of his chosen people, a prophet so that the non-Israelites couldn’t say “if only we had our own Moses, we would be as pious as the Israelites”; more than that, Balaam was blessed with the gift to know the exact moment God became angry or wroth, a deep and emotional intimacy which no other prophet or creature was given. By including Balaam among the patriarchs here, we’re able to include Jewish heritage as well as non-Jewish heritage, giving us a bit more wiggle room for those who aren’t Jewish or even Noahide in their lifestyle. I changed “who is from the stock of Israel” to “who is of your people”, making the prayer a bit more general for people who aren’t of Jewish descent to use while still establishing the mage as a person of God, godly in his works and faith, regardless of their Jewish birth heritage in favor of their Hermetic spiritual inheritance. However, for mages who actually are Jewish, I would recommend the original phrasing instead of my correction. I changed “who possesses this prayer” to “who gives unto you this prayer”. The Betz translation, taking a cue from Preisendanz, would suggest that this whole prayer might not be recited at all, but instead written as an amulet like many of the other charms and ritual apparatuses of the PGM, but this goes against the ritual instructions at the end of this part of PGM XXIIb, so I don’t think it’s meant to be written and carried around (though doing so wouldn’t hurt, if you were to go the extra mile). One alternative is to write down the first two paragraphs of the prayer as an amulet, while reciting the rest; that might be one possible breakdown, though I think it’s still better to recite the whole thing, with “possession” here meant metaphorically rather than literally. Really interesting here is the use of the word “maintain” here, which in Greek is διόρθωσον, the aorist imperative form of διορθόω, which literally means “make straight”, in the sense of correction, revision, amending someone, reconciling, redeeming, or restoring to order. The word has a medical connotation, too, of setting broken bones back in place, as noted by Phillip J. Long over at Reading Acts. Instead of using “maintain” which doesn’t really have many of those connotations, I opted for “rectify”, which literally means “make right” or “make straight”, and gives more of those connotations of διορθόω. ΕΠΑΓΑΗΛ ΑΛΑΜΝ: There are a few Greek words that start with έπαγα- that all have to do with glory, exulting, or dignity, and I think this might be a synthesis of a Greek word with the Hebrew godname ‘El, literally “glorious ‘El” or “glorious God”. ΑΛΑΜΝ, on the other hand, is strange, but van der Horst and Newman in their commentary on this prayer instead read its as “ALAMAN”, which they consider to be a corruption of Hebrew “`olam” or “`olamim”. This word is common in the berakhot of Jewish practice, where every blessing begins “barukh atah ‘Adonai ‘Eloheinu, melekh ha-`olam…” or “blessed are you, my Lord, our God, king of the world…” or, alternatively, “…sovereign of the universe…” or even “…ruler of the cosmos…”. However, in its plural form, `olamim can also mean “eternal” or, more poetically, “ages of ages”, and van der Horst and Newman note that ‘El `Olam would mean “God of Eternity”, suggesting also that we should read this as ΕΠΑΓΑ ΗΛ ΑΛΑΜΑΝ. Thus, I translated these divine names as “God glorious unto the ages of ages”. ΗΛΟΗΛ ΣΟΥΗΛ: Unfortunately, I’m not as clean here as with the above names, but I don’t want to read them as barbarous words, either. If we break this up into ΗΛ Ο ΗΛ ΣΟΥ ΗΛ, then we could read it as “God, the God, your God” or “God, the God of you, God”. ΗΛΟΗΛ is a weird theophoric name; although well-formed, like Μιχαηλ or Σαμουηλ, we don’t often see two divine elements put together, especially the same element, in the same name. If we break this up into several words, then we can get a reasonable Greek construction: Ἠλ ὁ Ἠλ, literally “God, the God”. Likewise, we can break up ΣΟΥΗΛ into σου Ἠλ, the second person singular genitive pronoun (i.e. “your”) and God. It all comes together as “God, the God of you, God”, which implies a divinity-within-divinity or divinity-upon-divinity. For clarity, and to imply a kind of hierarchy, I’m translating these as “God who is God of all gods”. It’s not an exact translation, but I’m comfortable in its meaning. And one more note: the barbarous word ΣΕΜΕΣΕΙΛΑΜ used at the start of the prayer is rendered as “Eternal Light” in the version without barbarous words. This is due to rendering the word as Hebrew “shemesh `olam”, or “sun of the world” or “sun of eternity”. This is translated as “Eternal Light” to avoid too heliocentric a focus of the prayer, despite the Prayer of Jacob’s and related prayers’ heliocentric theurgical focus, but bears an equivalent meaning. This isn’t really used in any of the source texts I was working with, but it’s a word I like using with a beautiful and appropriate meaning, so I used it in a place that seemed useful for it.